Creamy, extra cooling and with a crunchy bite! Ready in less than 10 minutes, this yogurt dessert is the perfect way to finish off a hearty meal. A light and smooth yogurt and lemon based cream with a wonderful texture, which resembles a lemon mousse, combined perfectly with crispy biscuits resulting in the perfect yogurt dessert! The key for this wonderful texture is to use strained yogurt, as it is smoother and creamier than other yogurts and make sure you use it cold! Top with some lemon zest or fresh mint and a sprinkle of crushed dark chocolate. Enjoy! To prepare this creamy yogurt dessert, add the yogurt, condensed milk and the zest and juice of 1 lemon in a large bowl, whisk, until the ingredients combine and the mixture is smooth and creamy like a mousse. 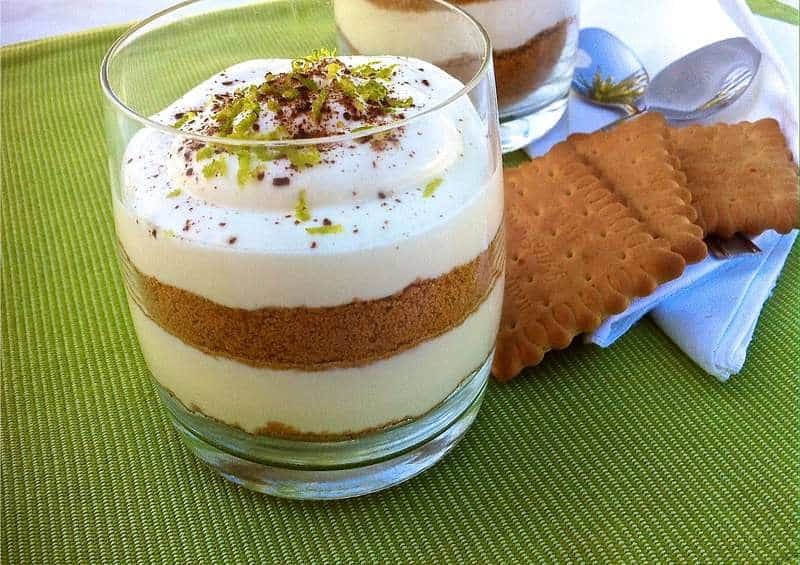 To serve, place some crumbled biscuits on the bottom of a glass or a bowl and top with the yogurt mousse. Layer the ingredients, according to your preference and top with some lemon or lime zest and crushed dark chocolate. For the strained yoghurt, can you simply use labneh instead of actually straining it as I’m considering this recipe to make in school and we don’t really get enough time.